The Frostfire wireless solar motion sensor light is suitable option for the people concern with their home/office security. This solar motion sensor security light is great buy for budget conscious people looking for high quality results and great performance. Installing Frostfire LED light is extremely simple, anyone (with or without any prior knowledge) can easily install it within minutes. The light comes 16 bright LED lights, which are water and heatproof. 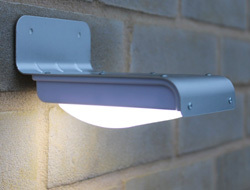 It’s a wireless motion activated light that can be fitted and moved around anywhere easily. It has powerful and perfect sensors that activate bright light within the 3 meter (9 feet) activation zone. The modern, stylish and simple design makes this light great, this is not only high performing light but also have a great design and look, all these features makes Frostfire 16 LED solar motion detection light so popular. The light is inexpensive and can easily fit in one’s budget. When you purchase Frostfire motion security light, the kit includes one solar light, activation key, two screws and wall plugs. Note when you buy this security light, it’s “OFF” mode by default and you have to activate it with the activation pin (which is included in the package) you must insert the pin to activate it first time. When activated, the light will turn “ON” bright for a few seconds then go back “OFF”. The solar cells comes with covered in a clear film that covers the cells, you must remove the cover before charging. Another great feature of this security light worth noting is the powerful motion sensors that ensure excellent dynamic response and maximum activation zone that detects even a small motion in a range of 3+ meters. After a full recharge the laser focus motion detection works whole night without going OFF. The motion sensor light goes brighter when it detects any motion and stays bright until no more motion is sensed. It’s bright enough to illuminate a doorway or pathway especially when you are fumbling for something at night. After no more motion detection, the light goes OFF after about one minute. There is no way to turn the light ON bright and keep it ON, brightness is only activated when it detect motions, that’s powerful solar motion detection technology. The light is automatically switched OFF during day and get ON at dusk. The light automatically goes into dim mode and stays ON constantly throughout the night. Warranty information is not available. Although this set of lights are made in China (almost all things are made in China these days : ) isn’t it?) They come with a number of advanced features that elevates their use globally. The Frostfire 16 LED Wireless solar motion sensor light is great with so many people praising about it. It works great and delivers more than expected. The motions detection sensors are great even detects small movement in the dark nights. Some customers noted that its motion detection is awesome getting wider range of activation zone, more than the item marketed! No batteries and cables are needed, making it real simple for fitting anywhere at your home; its design is modern and stylish with high quality performance. The only issue we heard about this item is, guess what, it isn’t with the item itself – it was the metal screws that comes with the item for fitting the light on the wall! Some people complaint it is very poor quality and easily breakable. So make sure you don’t break any of them while installation OR get some extra screw with you, not sure if you need them at the installation time.